The Davis Cup World Group Finals have arrived and we are running four straight days of unbelievable prize giveaways courtesy of the nice folks at Wilson Tennis and the ITF! Thursday 14/11: Wilson Steam 99S racquet (RRP £129.95) + signed memorabilia. Friday 15/11: Wilson Steam 105S racquet (RRP £129.95) + signed memorabilia. Saturday 16/11: Wilson Six.One 95S racquet (RRP £169.95) + signed memorabilia. Sunday 17/11: Wilson Blade 98S racquet (RRP £169.95) + signed memorabilia. The rules couldn’t be simpler. 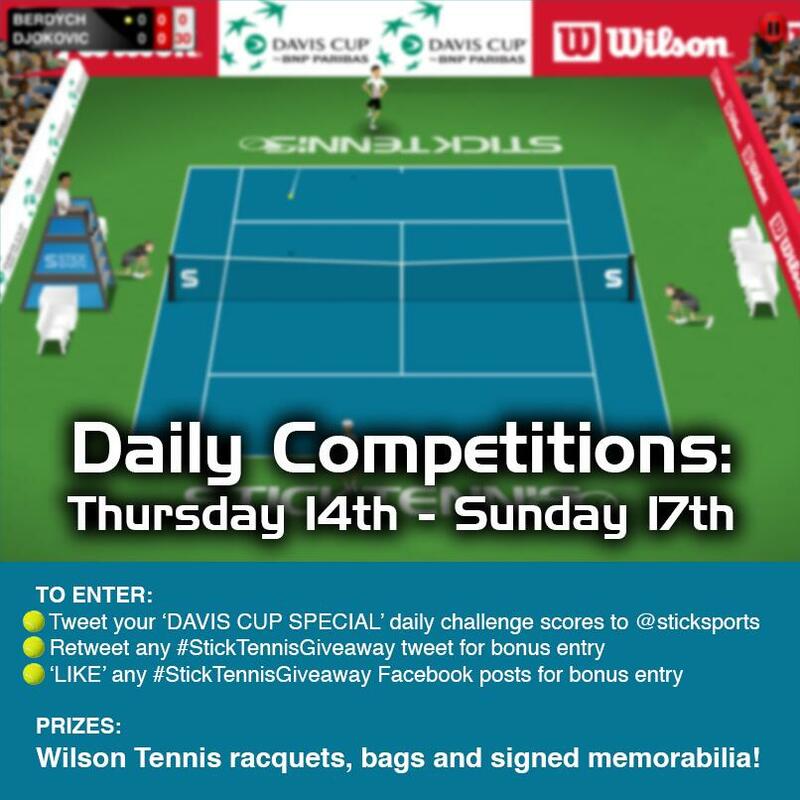 Starting on 14/11/2013 you play our ‘DAVIS CUP SPECIAL’ Daily Challenges and tweet your score to @sticksports, it really is that easy! For an extra bonus entry you can also retweet any #StickTennisGiveaway tweet or ‘LIKE’ any #StickTennisGiveaway Facebook posts each day. So what are you still reading this for? Go and get stuck into the Stick Tennis Daily Challenge!